BOSTON — Is there a parent alive who hasn‘t wanted to advise a son or daughter making a choice as important as marriage?And how many of you parents out there have wanted to say something — be honest — about your child’s choice of partners but bit your tongue, fearing the advice would be unwelcome or misconstrued? 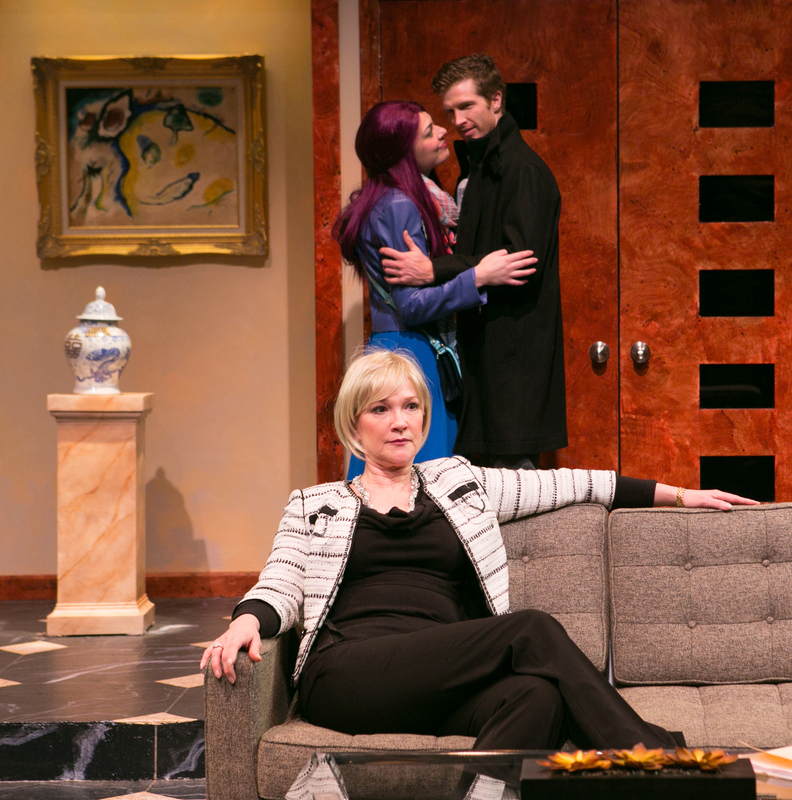 Whether father — or mother — always knows best is explored in Victoria Stewart’s “Rich Girl,” now at the Lyric Stage Company. The playwright’s work borrows from the circumstances of the characters Henry James novella “Washington Square” as well the stage play and movie “The Heiress,” stories about a imperious father threatening to disinherit his daughter if she marries a man he considers to be a golddigger. Amelia Broome, Sasha Catroverde and Joe Short in “Rich Girl.” Photo: Mark Howard. Stewart has borrowed from these stories with an important twist: the daughter here lives with her mother Eve (Amelia Broome), a former waitress who was abandoned by her husband and has picked herself up by her financial bootstraps and now offers financial advice to others (See: Orman, Suze) on CNBC. Unfortunately, the touchy-feely bits of financial advice Stewart has written for Eve don’t really ring true , although well-delivered by Broome. Broome has played the role of a mother fiercely trying to protect a daughter before, in her IRNE Award-winning portrayal of Margaret Johnson in Speakeasy Stage Company’s “The Light in the Piazza” in 2008. Sasha Castroverde is Claudine, Eve’s socially awkward and plain daughter, whose self-confidence is zero and whose bright purple hair is, in a word, off-putting. Celeste Oliva, who seems to have found an artistic home at the Lyric, is spunky and engaging as Maggie, an aide-de-camp and do-everything for Eve who also is someone whom Claudine can confide in. The dashing Henry Campbell (Joe Short), a former high school classmate of Claudine’s, seems to be everything a woman might want in a man with one small glitch: financial security. He runs an avant-garde theater company on a shoestring, spends much of time pursuing grants from foundations such as the one Eve has set up and asked her daughter to run. Even as Claudine turns down his request for funding for his theater group, he strikes up a conversation and invites her to his opening night. One thing leads to another and… But once burned, twice learned, and Eve — whose husband left her shortly after she put him through school and while she was eight months pregnant — is not about to let a man do the same thing to her daughter. She does a different kind of financial audit: on Henry, which sparks fireworks. Director Courney O’Connor is often hamstrung by the script , but she and the cast gives the thin Stewart piece the best possible chance to succeed, and there are times the dialogue sings, such as the teeth-bared confrontation between Eve and Henry. “I am not intimidated by you,” he says. “Say goodbye. You’re never coming back here,” she spits at him, full of venom. Along the way, Claudine finds a lot out about herself, asking herself if her mother, who at one point told her “you ruined my life” and can’t believe an attractive man would be attracted to her daughter, ever really loved her. You’ll have to decide for yourself what you think of the ending, and whether it’s a cop-out. 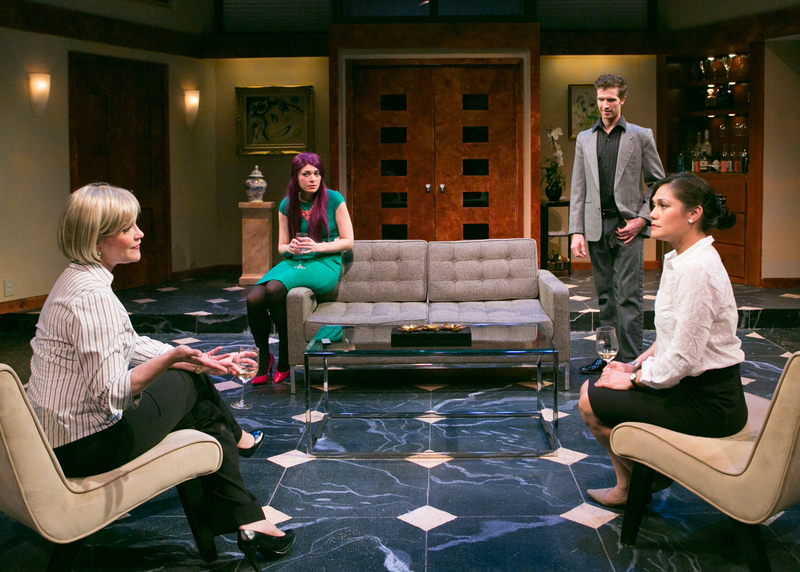 The Lyric Stage Company of Victoria Stewart’s “Rich Girl.” Directed by Courtney O’Connor. Sets, Brynna Bloomfield., Lights, Chris Bocciaro., Costumes, Mallory Frers. Sound, Brendan Doyle. At the Lyric Stage Company of Boston through April 26. Lyricstage.com.